Our thanks to Jack McFarland for this and other Wolfman Jack contributions to REELRADIO.
. . . find your main squeeze, get together, and try to please . 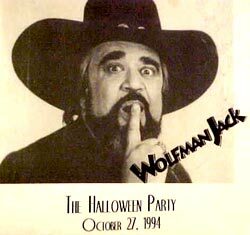 . .
Contributor Jack McFarland writes that Wolfman Jack was in Tulsa, Oklahoma for a Halloween Party broadcast on KOOL-106 FM (KQLL) on October 27, 1994. He taped some of the opening, and some of the closing, and that's what you'll hear in this exhibit. In addition to the music (most of which includes extensive accompaniment by the Wolfman), you'll hear a few local commercial breaks of the time. Logically, in the restrictive days of regulation, the commercial sets were quite short - at least compared to the free-for-few that resulted after the 1996 deregulation. It's fun to hear Wolfman playing great oldies for a live audience! Sadly, only a few months after this broadcast, Wolfman did his last show from Planet Hollywood.